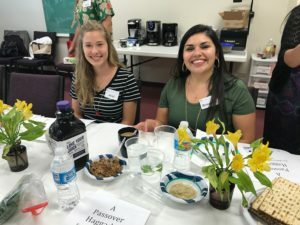 On the Wednesday before Easter, Grace House women gathered around the table for a Passover Seder following along with the Haggadah put together by Dr. Lois Mintz and her husband who are both born-again Jewish believers in Yeshua (Jesus). Fellow Grace House teacher and worship leader, Bernie Tosdevin, led the Seder alongside Dr. Mintz. What a blessing! We all learned that at the Last Supper Jesus redefined the rituals giving them new meaning and this Seder incorporated the symbolism that points to Him. What an honor to join together to draw closer to Yeshua Hamashiach (Jesus our Messiah).